Sanpellegrino Pesca+tea with jasmine and pleasantly bitter grapefruit add a complexity to an otherwise easy to drink sparkling peach tea, meaning Pesca Sipper is one that’s sure to impress when you have guests over at any moment of the day. 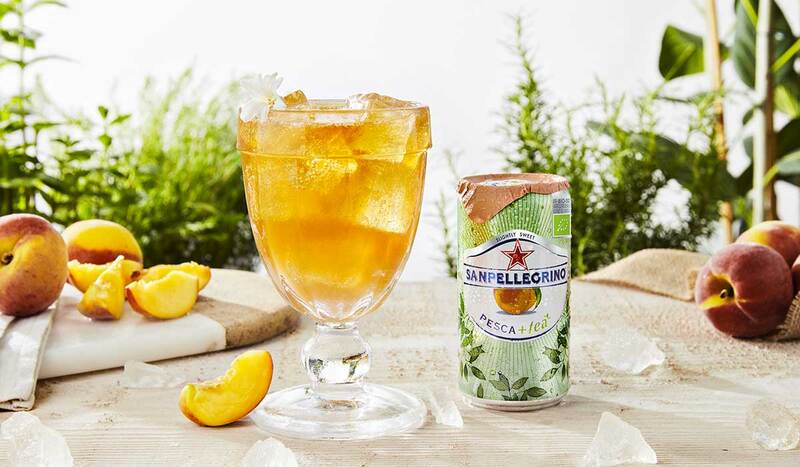 Sanpellegrino Pesca+tea’s delicate tea nuances shine alongside jasmine, while peach and pink grapefruit bring a richness with a touch of bitter to the Pesca Sipper mocktail. Notes of sweet, floral, tart come together in a sublime pairing that will add the sparkle to any special occasion, or casual get-together. Try it alongside our easy recipes such as arancini alla norma, the Sicilian-inspired Alici nella Meraviglia or any of our other Zesty Food suggestions and let in the Italian carefree spirit to your home. Pour the syrup and juice into a tall glass (13 oz/40 cl capacity). Stir well using a bar spoon and fill up with ice. Top with Sanpellegrino Pesca+tea and garnish with a jasmine flower (optional). If you are 18 years old or over you can turn the Pesca Sipper into an alcoholic drink by adding 1 oz/3 cl of London Dry Gin and stirring well.